Idealistic scientists, less idealistic military-industrial complexes, and governments of varying ethical strength are always creating things that they shouldn't in the real world and in The Outer Limits. The Outer Limits has often been considered to be the poor man's Twilight Zone, and the show's own introduction isn't much help. Whereas The Twilight Zone's Rod Serling invites you to "a land of both shadow and substance, of things and ideas", the narrator of The Outer Limits threatens to mess with your TV reception. Control the horizontal and the vertical? Heck, I have to correct those things anytime my six-year-old nephew's been near the TV. The Twilight Zone also tends to stand out in our memories because of its fondness for twists, revelations, and irony. The last man on Earth, delighted to finally have time to read, breaks his glasses. A woman gets multiple surgeries to make her look like everyone else, only she fits our definition of normal and those around her are what we'd consider monsters. And who can forget the infamous "It's a cookbook!" ending of "To Serve Man"? Told in a brisk 30-minutes, Twilight Zone episodes were lean exercises in social commentary. In fact, Serling felt that stretching the show out to an hour would pull it into diluting, soap opera territory. The Outer Limits, however, dove headfirst into the demands of its hour-long format, mixing strong characterization into its mix of science fiction horrors. Quite frankly, it was an uneven mix. On the stronger side, you have episodes where the science fiction takes a backseat to the characters. "It Crawled Out of the Woodwork" finds the presence of a dangerous energy creature competing for screen time with the relationship between two brothers, and the effects of one brother's death on the other. When "The Mice" features a convict volunteering for a teleportation experiment with another planet, we find out more about the prisoner's personality than we do about the inevitable alien deception. "The Human Factor" relies just as much on the blossoming relationship between two scientists as it does on the story of the technology. So it's surprising that, with plenty of time to explore both plot and characterization, many of these early episodes are clumsy (Volume I covers half of the first season's 32 episodes). In "The Galaxy Being", an alien visitor delivers the standard message that Earth is too primitive and prone to violence, then tells the assembled crowd of gawkers to go home -- and they do! Maybe where these folks live, giant radiation-spewing aliens are a dime a dozen, or maybe the story takes place in some philosopher's paradise, where the residents take to heart the alien's urging to contemplate the nature of the species and the mysteries of the universe. Or maybe these people just go home and watch TV . . . either way, the story leaves one wanting. In "The Architects of Fear", a well-meaning cadre of scientists surgically converts a man into an alien for the purposes of uniting Earth against a fictional common enemy. Naturally, things go wrong, but we're never told why. “The Borderland” tells the story of a scientist who’s discovered a gateway into another dimension, a discovery that a rich tycoon latches onto in the hope that he can contact his dead son. However, the episode also features a scheming friend/ executive employee of the tycoon, who has plans of his own. There are several scenes where this character intimidates the scientist behind the tycoon’s back, but it never really affects the story. In fact, it’s a distraction. “The Borderland” and “The Architects of Fear” are also representative of many episodes in the series, where the plots depend on the fact that, apparently in the '60s, you could just stroll around unguarded power plants, government bases, and top-secret labs, doing whatever you darn well pleased. And we won't even get into the faux-jargon peppering many episodes, such as the need to "reverse the electron spin" to reverse time in "Controlled Experiment". Or the fact that human "psychiatry units" are repeatedly used to determine the motives behind alien communications, to determine the trustworthiness of messages from intelligences completely unlike our own. It’s tempting to give The Outer Limits a pass on things like this, to dismiss such lapses in logic as the necessary byproduct of a young genre. But when an elderly fortune teller and her assistant can traipse around a power plant, well, that’s just bad writing. The show did, however, reflect the fears of its times. The Hundred Days of the Dragon is steeped in the Second Red Scare of the '40s and '50s. Involving a plot where Communist spies from an unnamed Asian country replace the president of the United States with an impostor, the episode also features actor Sidney Blackmer indulging in a stereotypical Asian caricature that has to be seen to be believed. He doesn’t go so far as to dredge up the fractured English that so often marked Asian stereotypes, but he effects several changes in his physical bearing. Anytime he’s meant to convey his true nature, such as when he’s talking to fellow spies or to the despot who commands him, Blackmer’s character narrows his eyes to slits and adopts a facial expression that’s an odd mix of arrogance and deference. With its serum that results in the “molecular plasticity” that makes the impostor’s face malleable, “The Hundred Days of the Dragon” stands as a highpoint of another Outer Limits trend. 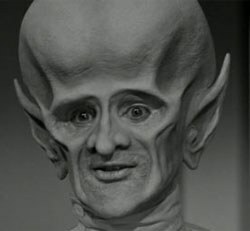 Throughout the episodes of The Outer Limits, scientists inject people with all kinds of crazy serums and compounds and implants, always with disastrous results. "The Man Who Was Never Born" envisions a future wasteland inhabited by mutant survivors -- the result of a scientist tinkering with an alien microbe. 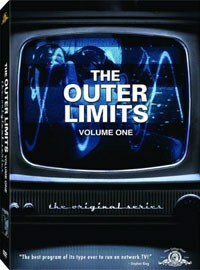 In a remarkable show of uncharacteristic restraint, The Outer Limits took a whole six episodes to indulge in time paradoxes, which were well-worn territory even in the science fiction of the ‘60s. By the time The Outer Limits came around, short story writers like Alfred Bester had left few stones in the timestream unturned. 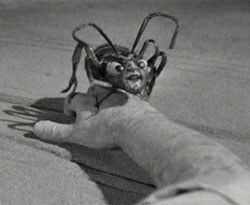 Watching The Outer Limits -- with its numerous tales of science gone bad and of dire fates befalling scientists who apparently never read Frankenstein before they decided to play God -- it’s a wonder every scientist in '60s America wasn't tarred, feathered, and driven out of town on a rail. As far as The Outer Limits is concerned, science is our greatest hope, but it’s also our greatest danger. But the series' most “outrageous” episode might be "O.B.I.T.". Here, we have a secret, omnipresent surveillance system called the Outer Band Individuated Teletracer (O.B.I.T.). O.B.I.T. is so effective that it’s lowering staff morale and inducing mental breakdowns in a government lab where it’s being used. Even the most private actions are captured and recorded; the most insignificant examples of insubordination are permanently held against employees. After a lab employee is found murdered, a crusading Congressman sets up a series of interviews to get to the bottom of things. As the truth of O.B.I.T. slowly becomes clear, the men in charge of the project reassure the Congressman that "people with nothing to hide have nothing to fear". In this age of domestic wiretapping and secret laws, an episode like “O.B.I.T” strikes a chord because it seems to predict, to some degree, some of the issues we face today. But its naiveté also awakens your inner cynic. A senator risks his career and chances for re-election because he refuses to quit hounding the powers-that-be for answers? That, you tell yourself, is the height of ludicrous science fiction. After all, everyone knows that evolution removed our lawmakers' spines ages ago. As a piece of prescient science fiction, “O.B.I.T” displays the value of art that goes against the prevailing ideas of its time. When The Outer Limits aired in the early ‘60s, it came on the heels of one of America’s most prosperous times; post-World War II America was in a boom in every sense of the word. But the early ‘60s were also a time when there was a growing sense that things needed to change. The Civil Rights Movement was starting to emerge, the counterculture was becoming more and more prominent, and there was a growing sense that the people whose job it was to protect us might have their own agendas. There was also science’s boomtown mentality to consider. Scientific discoveries were coming at an alarming rate, with the invention of the laser, the launching of satellites into orbit, and plans to land a man on the moon. It was only natural to wonder if science wasn’t progressing faster than our ability to understand its consequences. And, as much of the industrialized world’s focus turned towards the stars, it was only natural to wonder if something might be looking back. Television, though, wasn’t the place to air those doubts, even via satire (as the Smothers Brothers would find out from their experiences with network censors on their politically-conscious The Smothers Brothers Comedy Hour at the end of the ‘60s). 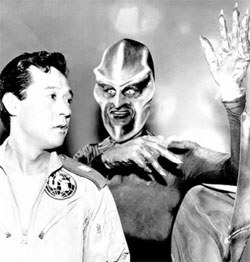 Perhaps it was due to science fiction’s perpetual reputation as a lesser genre, fit only for kids, but shows like The Twilight Zone and The Outer Limits were one of the few places where viewers could find veiled references to the issues of the times. Even now, when the idea of questioning the status quo is much more accepted, it’s telling that one of the few no-holds barred venues for social commentary on TV is the resurrected Battlestar Galactica, which has included everything from martial law to torture to suicide bombers in its exploration of what, under adversity, truly defines humanity. In the world of The Outer Limits, idealistic scientists, less idealistic military-industrial complexes, and governments of varying ethical strength are always creating things that they shouldn't, hiding those very things they shouldn't have done, getting duped by aliens, and, in our constant quest to discover the secrets of the universe, proving that Faust may have been one of speculative fiction’s first great archetypes. The Outer Limits would quickly find its footing in its short '63-'65 run, even bringing in a few outside writers like Eando Binder (I, Robot, a different story from the Isaac Asimov tales that inspired the 2004 Will Smith film of the same name) and Clifford D. Simak. Two episodes were written by Harlan Ellison. “Soldier” tells the tale of two warriors sent back in time to 1964, where they must continue their battle. “Demon with a Glass Hand” is the story of a robot sent back in time by a decimated humanity, but who is followed by the aliens who have taken over Earth. When James Cameron released The Terminator Ellison sued Cameron, accusing him of plagiarizing elements of “The Soldier”. Cameron settled out of court, and mention of Ellison’s contribution was added to The Terminator’s credits. “Demon with a Glass Hand”, for its part, won several awards. Despite that later success, the 16 episodes found on Volume One -- half of the full first season -- is full of rough spots as its creators try to strike a balance between hard science fiction and the motivations of its characters -- two camps that haven't always coexisted peacefully. The Twilight Zone probably deserves to be more revered than The Outer Limits, but The Outer Limits was influential in its own right. This first volume holds plenty of eye-rolling moments, but more importantly, these episodes signaled a new way of telling science fiction stories on television. Occasionally, the story and characters of an Outer Limits episode become more important than the time portals or experiments, and that’s something The Twilight Zone, with its twists and turns, could rarely claim.